With recorded phrases like “Hey, Hey, Hey”, “Ridiculous”, “Absurd” and “Nicely Done”, Milton the electronic game has attitude! 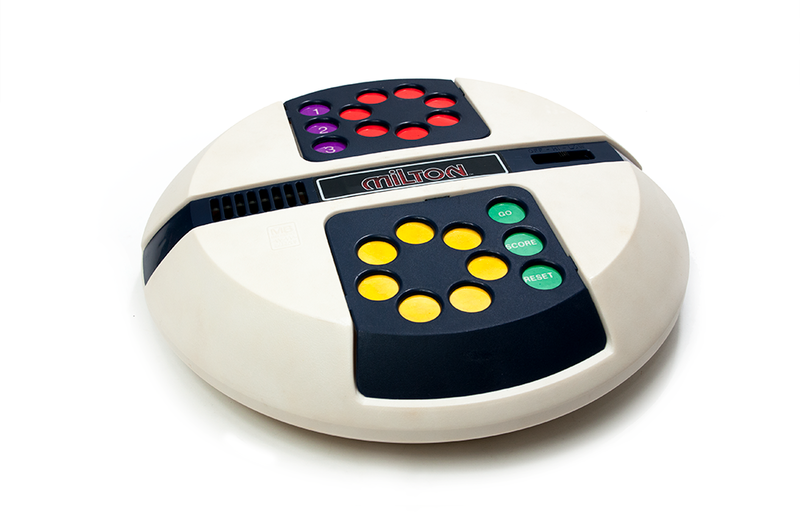 Released in 1980 by Milton Bradley, Milton was an innovative, computer-controlled successor to popular “beep generation” microprocessor-driven games, like Simon and Merlin, that hit the market two years earlier in 1978. Shaped like a desktop flying saucer, Milton’s repertoire includes three speech-synchronized games: Nicely Done, Whoop-De-Doo, and Speed’s the Key. Each game is a variant on the same phrase-matching theme, with one or two players attempting to correctly recall and match words to make up proper phrases. Here’s how Milton incorporates speech into electronic gameplay. By pressing one of seven red buttons on the game face, a player causes Milton to utter the first two words in a three-word phrase (for example, “Drink your…”). The player must then press the correct yellow button to generate a word to properly complete the phrase (for example, “milk”). Skills required include a the process of elimination or a good memory for previous selections. If an attempted match is correct, Milton verbally responds with praise. If the match is incorrect, Milton hurls an insult at the player via a negative phrase or sound effect. In a two-player game, the player who makes the most matches wins. To express his prickly personality, Milton was programmed with a 90-word vocabulary, allowing the game to generate more than 30,000 possible three-word phrase combinations. The game is powered by an AC adapter. With large sad brown eyes, a drooping mouth, and mop of unkempt blond hair, Hasbro's Little Miss No-Name was designed as the antithesis of the impossibly glamorous Barbie.